I'll be the first to admit it - I have the attention span of a flea! Now, I don't know that many fleas personally, but I have a feeling they wouldn't be the best at concentrating. Similarly, my mind enjoys wandering from here to there on a whim...usually at the worst times. In May we'll be flying to Colorado to attend a graduation and visit family. Since we'll be gone for almost a week, we've been seriously investigating what to do with the girls while we're gone. We've ruled out taking them with us for OH so many reasons, but there are still several options for them here. Do your research before leaving your pets at a kennel. Ask about their schedule - are they allowed out and about during the day? How often are they fed, walked and groomed? How many other animals will be around for them to socialize with? Is there someone available overnight to check in on them? Even with little in the way of extra money in the bank, your family can have a great "stay-cation" anytime you want! Try thinking of the activities, restaurants and historic sites in your town the way a tourist visiting you would, and you can save tons of money while having some great quality time together. And you don't have to spend money on a hotel! * Visit your town's tourism office. Walk into a visitor's bureau office and you'll be instantly surrounded by information, tickets, offers and specials for all those great activities happening around you. Chances are you haven't been to some of them since you moved to town, so this is a great opportunity to see what's happening. Plus you know whatever money you do spend is staying local. I am just about desperate for snow. We live in South Carolina, a state with perpetually warm temperatures and little chance of flurries. Now I'm originally from Iowa and this corn-fed girl needs some snowflakes every now and then to keep the winter spirit alive. These are a couple of masking techniques, using one piece to cover up another and stamp ink around it. If you're craving snow as much as I am, these might just do the trick. For the snowflake frame, cut a 3x3 inch square of cardstock. Cut a 2.5x2.5 inch square and adhere it in the center of the larger square. Using an embossing ink pad, coat the exposed edge with embossing ink. Sprinkle with light blue embossing powder and heat with heat gun. For the entire month of January I have been studying what the Bible says about joy. Some of it has come as a surprise to me, and my own cup has overflowed on many occasions. Joy is a powerful gift from God that washes over both ourselves and anyone we come into contact with. What a true joy joy is! But there are days that we sure don't feel joyful, and begin to wonder where the joy has gone. How do you claim the joy of the Lord for yourself? It's already inside you, at least it is if you're a saved woman. God placed it there at the moment of salvation as His gift to you. So if it's already there, firmly planted in our heart, we'll never be able to lose it. We simply neglect it and allow the day's circumstances to overshadow it. The closet in our master bedroom has been driving me crazy for ages! Danny's side is wonderful, but mine has slowly been flowing over and out of control, as you can see from this before picture. This weekend I went to setting it to right, and you can do exactly the same thing in any of your closets with the same four steps. 1. Clear everything out. Empty your closet of anything and everything - take the clothes out, clear off the shelves, make sure the floor is empty and remove anything from the walls. We want a completely blank slate to work from. 2. Clean. Wipe down all the shelves and the rod under them. Sweep the floor with a carpet powder or sweep and mop if it's a tile floor. This is also the time to repaint if you're going for a completely different look. When you're the wife of a funeral director, time becomes incredibly precious. We never know what hours of the night and morning Danny will be out on a call, and he can't just stop what he's doing when 5:00 rolls around. Sometimes we'll see each other long enough to eat dinner and go to bed, but that's part of this calling God has given us. So when we had the opportunity this weekend to take a free tour of the Riverbanks Zoo, we jumped at the chance! We left all our concerns in the car and forgot about all the pending projects at home. For one afternoon we were simply a couple. I had truly forgotten what it was like to stroll arm-in-arm, regardless of cold temperatures and chilly winds. It was a blessing to my heart to watch my husband ooh and ahh over the tigers - his very favorite. We enjoyed watching the bear do a face-plant in the mud, and then shared a cup of coffee. Our home population has grown exponentially this week with the addition of one house guest - a tiny Dachshund named Tootsie. Now remember, my girls are getting up in years, so adding a year-old energy ball to the home dynamic has been interesting. We've puppy-sat for other friends before, so the opportunity seemed wonderful. And she is a cutie. She loves cuddles, she'll play endlessly and if we needed one, she'd be a great watch dog. However, she is definitely a puppy. We're having to readjust to housebreaking, chewing on things that aren't chew toys and bursts of pent-up energy. She doesn't quite understand that she can do her business outside while she's running in circles barking. When I was a little girl my grandmother had a copy of the Betty Crocker Cook Book for Boys and Girls. It was published in the 1950s and had the most wonderful recipes and color photos of meals children could easily handle making. I looked through this book so many times that the covers eventually came off and several of the pages were loose. My absolute favorite picture was the two-page spread of the ice cream cone cupcakes. 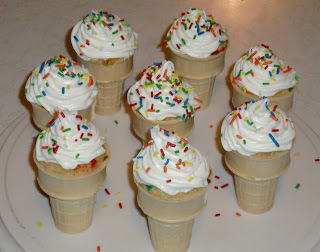 Each cone was a different color and they were so carefully decorated with sprinkles and candies. I thought they would taste almost as good as a real ice cream cone, filled with some special cake batter. So here is my version, made 20+ years later. So sweet, and so easy! 2. Prepare the cake mix as directed on its box. 3. Fill each cone 3/4 full. Place on baking sheet, being careful not to topple them when you move it to the oven. Think about all the different kinds of crafts there are - scrapbooking, jewelry making, sewing, home decorating, rubber stamping, knitting...and there are so many more. But why do we feel the need to make and do these lovely things for our homes? Look through the Scriptures and you'll see many examples of crafts and homemaking. God has given us a very special ministry and our crafting is part of that. What's the point in rejoicing? Why should I have to be joyful all the time? What if I don't feel any joy right now? Scripture doesn't say, you'll have joy waiting for when you feel like being joyful. Or, be joyful when there's a good reason or the perfect opportunity. And it definitely doesn't say, some days you'll have joy and some days you won't. Joy isn't wearing a new outfit or having a great meal out at a restaurant - that's happiness. Happiness is an emotion that changes with our circumstances. Joy is the deep-seeded pleasure and excitement that comes only from God. Were you one of those women who determined to exercise more in 2010 than you did in 2009? Danny and I started the P90X workout program for the third time last week. I get up every morning and exercise, then watch what I eat during the day. And we're more determined than ever to get in shape, keep our weight managed and eat a healthy diet. There are a lot of cross-overs between the exercise world and our Christian lives. I've found that many of the same things that I've heard Tony Horton say on our DVDs are things that I say to myself and read in the Bible when I'm improving my walk with God. On Tuesday of this past week our power went out. It was out from around 9:00 in the morning until about 4:00 in the afternoon. We found out that all the rain we've been having in central South Carolina had ruined the cables in the backyard and they had burned through. This in turn had jolted our phone lines, which meant we had no phone service or Internet until Wednesday evening. There was no electricity of any kind on Tuesday, which meant no heat, no lights and no power to heat food. I spent most of the day reading and scrapbooking, two activities I haven't given myself time to do lately. I just praise God that it wasn't super-cold or a cloudy day so I could sit by the window with my book. I moved the craft table over by the window, too, so I could see all the little parts and pieces. I can tell the girls have reached middle-aged: they're going gray, Sadie's slowing down a bit and they've both changed their attitude over the years. I'd like to say they've mellowed out a little, but it's actually the opposite. As dogs age they have different needs and issues than when they were puppies. (But the girls will be perpetual puppies, I'm sure.) The only thing that gives their age away is the gray around their muzzles. I think it looks distinguished. Most noticeably, older dogs gain weight much more easily than they did when they were younger. They tend to be less active and we baby them with more treats because they seem so pitiful. Talk to your veterinarian about balancing amount and kinds of food with the activity level of your pet. It's been downright chilly over the past couple of weeks - by South Carolina's standards. The thing about winter, though is that you can always put another layer of clothing on, but in summer you can only take off so much. One financial concern during these cold months is the drastic increase in our energy bill. We just can't afford to pay so much extra...so what's a woman to do? Without knowing a thing about how thermostats or central heating units work, we can make a few small adjustments and reduce our heating bill substantially. 1. Lower the thermostat during the day. Remember the number 68. Don't set your thermostat any high than 68 degrees regardless of how cold it gets - put on a sweater. Lower that number during the day when it's a little warmer outside and you'll save even more. War. Hunger. Poverty. Depression. Recession. Abortion. Violence. Abuse. Homosexuality. Drugs. Rejection. Debt. Homelessness. Alcohol. Death. Suicide. They're everywhere - on our streets, in the newspapers, posted all over the Internet. We are bombarded with reasons to hate, to give up, to give in. But with all of these terrible issues going on around us, Christ speaks of His joy. No matter what may threaten to overwhelm, we are to follow the Lord's commandments. Whether those around us will keep them or not, we are to be faithful. Obedience and God's love go hand-in-hand, and that love is where our joy comes from. When you look at the items a woman has chosen to decorate her house with, you can immediately tell if she appreciates the past. You'll notice antiques, framed black-and-white portraits and souvenirs from great trips. Or you'll find mass-marketed knick-knacks that anyone can go buy. The difference is how much she allows the past to influence her life. So how can you pull out the treasure trove of memorabilia from your past and put it in its proper place in your home? * Pull out your pictures. Remember that I'm a scrapbooker! Photos weren't meant to be stuffed in a box and thrown in the back of the closet. Fish them out, sort them and then frame them or scrapbook them. Turn them into conversation pieces, not box-fillers! How many times have you wished there was just one extra hour in the day? There seem to be more things we'd like to do, or have to do, than there is time to get to all of them. What if I told you there's at least an extra hour of time in each day just going to waste? Here are some simple changes you can make in your own life and find that extra time you've been looking for. 1. Go to bed earlier. What? That sounds like you're losing time, not gaining any! But wait - think about you're probably doing during those evening hours. Are you watching television shows you shouldn't be? Reading books you could live without? Eating food that not the best for you? If you can, go to bed an hour earlier and use that time to rejuvenate yourself for tomorrow. You'll be rested and ready to go instead of worn out before the day begins. As a general rule, I don't advise making resolutions. They aren't lifestyle changes, but things we decide to do on January 1 and have probably already broken. Instead, why don't we make some financial decisions today that are actually doable and can last the entire year? Before you do anything financially, pray about your choices and talk through them with your husband. This is Biblical and necessary for the Lord to bless anything you do with your money. Remember, He's the one who owns the cattle on a thousand hills and the wealth in every mine. It's just ours for a time because He allows it. After your prayer time, think about each of the following steps and write down a plan of action for the upcoming year. I think I could probably eat shrimp every day. It's by far my favorite seafood and it's so quick and easy to fix. Shrimp can be paired with so many different flavors, so I really could have it every day for a month and not have the same dish twice. This is a new recipe I found (and quickly altered to fit my personal taste) that is absolutely dreamy. 1. Mix lemon juice, mustard and garlic in a zip top bag. Add shrimp and toss to coat. Marinate in the refrigerator for 15 minutes. 2. Prepared spaghetti according to box directions. 3. Heat shrimp in 2 tsp olive oil over medium heat, about five minutes, until pink. 4. Drain pasta and return to pan. Toss with crushed red pepper and parsley. Top with shrimp and serve with a pretty salad or some steamed vegetables. Are you ready to get yourself organized? Here's a great do-it-yourself organizer that takes just minutes to make. Plus you can hang it, lean it and make it in any color combination for keeping or giving as a gift. I used some leftover Christmas ribbon and a silk flower for this one. 2. Run a length of tape along the bottom edge of the ribbon creating a pocket. This way you can tuck papers into each one without it falling through to the bottom. 3. Add layers down the length of the cardboard, each one overlapping the tape from the one above it. Tape back and bottom. Have you ever heard someone say, or heard yourself say, that they'd lost their joy? I read an article the other day about some women who were part of a "happiness project" to spend a year finding the happiness that they'd lost. Happiness and joy are two completely different things - joy is planted in your heart at the moment of salvation by a loving, merciful God. Happiness is a human emotion that fades or increases based on circumstances. The confusion happens when we forget that joy never leaves us, it's all about focusing on what joy truly is. This is the day that we take down our Christmas decorations at our house. There's not the same excitement that there was putting them up, especially when I think about dusting and cleaning again so the everyday things can come back out. As we un-decorate (de-decorate? anti-decorate? re-decorate? ), we can make the task more manageable and organize so that next year's decorating will be that much easier. 1. Take pictures. If you really liked the way something was displayed or arranged, take a quick picture before you tear everything down. Then store them all in a file until December. 2. The tree. Don't store the tree back in its original box - the cardboard will break down over time and attract bugs. Instead, invest in a tree bag that seals so nothing can get in. Do you know where you want to be in life this time next year? In five years? In ten or twenty years? If you've prayed about the direction God would lead you, you'll want to do some serious long-term planning. And that means lists! I love lists - I have daily lists, weekly lists, monthly lists, yearly lists, prayer lists and lists of what lists I have. I enjoy making them, following them and marking things off them. I even have a friend who buys notepads for me just so I can make more lists! When you're thinking about the future and the goals you'd like to attain, figuring out the steps to get there is vitally important. Most long-term goals have lots of little short-term goals that lead up to them. Making lists of those steps and seeing in black and white what needs to be done can make reaching them a little easier. Sadie has been incredibly itchy lately, probably from the dry air in the house. We've changed her food and began bathing her with a medicated anti-itch shampoo. This is her typical look when she's in the tub - not a water dog by any stretch of the imagination. I have fibromyalgia, so bathing puppies in the tub has never been easy for me. Sadie also has severe hip problems in the back, so I've had to find lots of ways to make this process a little more enjoyable for all three of us. 1. Groom the puppies first. If you don't, the hair will mat and never get clean. Or it will all come out in the tub and you'll be fighting with that, too. Grooming will also help remove that dead hair and dander that make them dry and itchy. Perhaps you read what a popular woman's magazine recently wrote: What happened in 2009 stays in 2009! I understand the logic of the New Year - a fresh beginning and a chance to try things differently than you did last year. January first is a good marker of milestones and and opportunity to start something new. But what this magazine wrote for thousands of women to read just isn't true. The sins that we committed in 2009 have consequences that will carry over into 2010 regardless of how many balls are dropped or horns are blown. They don't get magically erased when the cheers begin at midnight and everyone sings Auld Lang Syne. The stroke of twelve doesn't produce some fairy tale reaction in our hearts, promising that the coming 12 months will be markedly better than the previous.